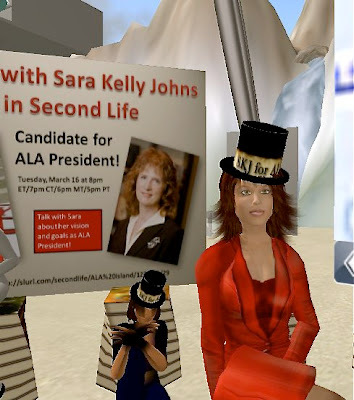 I support Sara Kelly Johns for President of ALA. I've met her, talked to her, read her webpage, and I think she has what it takes to represent us Librarians vigorously and nationally. And its time we had a school-based librarian in charge of the ALA. It's been a few years (how many? don't know...Bueller? Anyone!?) .....Seriously though, I really think she can close the gap between ALA-AASL and ISTE-SIGMS...she *wants* to work together! That's progress! 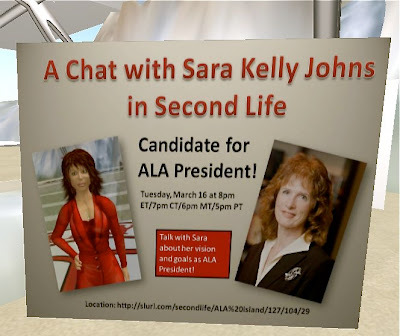 Visit her official website: Vote SKJ for ALA! Quoting from a message from Lisa Perez to all members of Media Specialists SIG on ISTE Community! yourself and share your priorities. 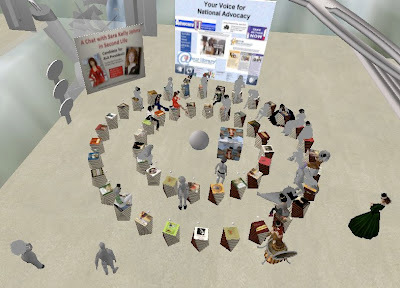 Join us at ALA Mainstage: SLURL or IM Elaine Tulip (or Redgrrl Llewellyn!) for a teleport. up your free basic account. subsequent screens to create your avatar account. search, and edit your appearance.